The lowdown: Let’s get this out of the way: Sake is not a spirit. Sure, many varieties may be as clear and colorless as vodka or white rum, but there’s no distillation involved. Another thing it’s not is wine. I know, people frequently refer to it as “rice wine,” its ABV is typically within a few percentage points of wine’s, and the government taxes it like wine. But in fact, you’d be less wrong if you called it beer, as it’s fermented from a grain base and the companies that produce it are called breweries. But really, sake is its own thing. 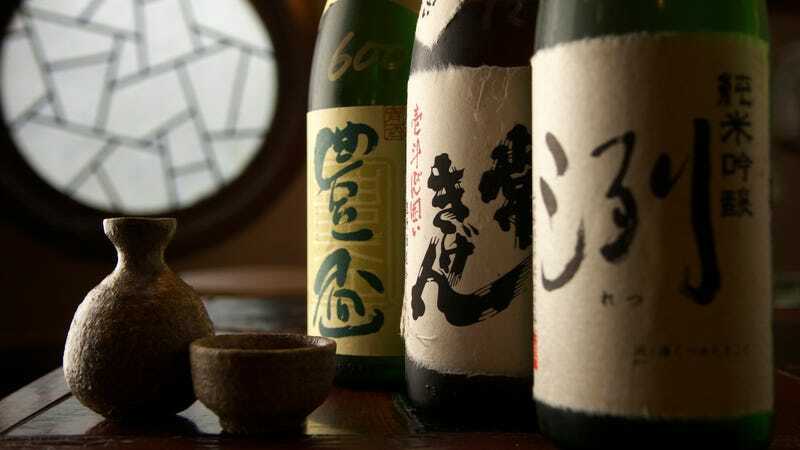 Sake, or, as it’s often called at home, “nihonshu” (“Japanese sake”), traces its roots back more than 2,000 years, around the time that rice made its way from China to Japan and Japanese farmers started cultivating the grain. The first written mention of a Japanese rice-based drink appeared in a Chinese history book circa 300 C.E. Of course, that ancient beverage bore only a passing resemblance to the crisp and refined modern liquid into which sake ultimately evolved. One of the core elements that makes nihonshu such an iconoclastic drink is the presence of koji, a mold that produces the necessary enzymes to convert starch into fermentable sugar. In beer (and whiskey), brewers achieve that by malting barley. Sake makers inoculate koji onto rice and allow it to grow, release those enzymes, and break down starch into glucose molecules small enough for the yeast to eat. Koji is quite pervasive in Japanese cuisine; it’s used in soy sauce, miso, rice vinegar and the distilled spirit shochu (a story for another day). The microbe is more than just a means to a fermentation end. It’s also a huge source of sake’s flavor and character. The taste: Sake can range from dessert-y sweet to bone dry, from fruity and floral to grainy, nutty and savory. Some can be crisp, clean and refreshing, while others can be remarkably wild and funky. And, as is the case with most of Japanese cuisine, umami can express itself quite boldly in the drink from time to time. None of that happens by accident. It all comes down to the quality of the raw materials and the production process. Only certain varieties of rice are ideal for sake-making and the concept of terroir even comes into play. As for process, the key to unlocking rice’s flavor nuances is to polish away—or mill—the outer mass of the kernel, scraping off much of the grain’s fat and protein and leaving the starch, concentrated closer to the center, intact. Once upon a time, artisans painstakingly polished grains by hand, but these days, milling machines do the heavy lifting. The degree of polish determines much of the flavor and aroma, as well as the sake grade. The point at which premium grades of sake begin is a polish ratio, or seimaibuai, of 70 percent—that means at least 30 percent of the grain is milled away and 70 percent remains. Sake using rice with a seimaibuai of 60 percent—i.e. 40 percent has been polished away—is ginjo grade. When 50 percent or less of the kernel remains, we’ve reached daiginjo grade. As a rule, the lower the seimaibuai, the more delicate and nuanced the flavor and aroma. Now, I’m going to backtrack to that 70 percent seimaibuai and throw a bit of a curveball with some additional nomenclature. When the polish ratio is in that premium-grade realm of 61 percent to 70 percent, the sake can be either a junmai or a honjozo. The former means it’s “pure rice” sake and contains no additional alcohol. Honjozo means a small bit of distilled spirit had been added to the mash. Is that cheating? No, it’s not. The tradition of adding spirit to the mash is rooted in necessity. Several hundred years ago, not long after distilling arrived in Japan, brewers discovered that they could prevent spoilage if they added some spirit to the recipe. In more recent history, during and immediately following World War II, a rice shortage necessitated such a practice. These days, however, it’s mostly an stylistic choice. (It’s quite common for a brewer to have both junmai and honjozo products in its portfolio.) Adding alcohol to the mash helps brewers achieve a particular flavor profile. It concentrates the aroma and imparts an oily, silky mouthfeel to the beverage. So, if you see a bottle labeled, simply, “ginjo” or “daiginjo” and not “junmai ginjo” or “junmai daiginjo , it’s likely a honjozo. There are no hard and fast rules about what you should be tasting or smelling in each sake grade, but daiginjos, as well as many ginjos, tend to be more on the fruity and floral side of the flavor spectrum. Melon, pineapple, banana, green apple and violet are common descriptors. Much of that character is thanks to the koji. A bit more umami often shines through in junmai proper, particularly when there are more amino acids present. But again, I’m painting with broad strokes here. Ginjo-grade sake frequently can be quite umami-forward. Nigori—the cloudy, milky variety that retains rice particles through course filtration—adds a bit of sweeter creaminess to the equation. Possible Gateway: A (relatively) widely available example of an approachable junmai with both fruity and rice-y notes would be Tozai Living Jewel, from one of Japan’s finest sake-making regions, Kyoto’s Fushimi district. For a sense of junmai ginjo or junmai daiginjo territory, my go-to has been Kanbara Bride of the Fox from Kaetsu Shuzo. It’s marketed as a junmai ginjo, but its polish ratio of 50 percent puts it on the cusp of daiginjo. The only caveat is that Bride can be a bit pricey—between $35 and $40 for a 720-ml bottle. The good news is there is plenty of world-class sake being produced by a growing number of American brewers, available for a significantly lower price than comparable Japanese brands. The best example is SakéOne, producer of the Momokawa brand, in Forest Grove, Oregon. Its Momokawa Silver dry junmai ginjo is about as quintessential as it gets. Next Steps: Springtime is always a treat for aficionados, as that means it’s nama season. Namazake or nama-nama is completely unpasteurized sake, raw and alive and requiring special handling. When stored at the right temperature and away from damaging light, it’s fresh, brisk and bright—kind of like spring itself. Also, if you happen to see the word genshu next to a brand’s name on a menu, definitely have a taste. Sake usually is brewed to between 17 and 20 percent ABV, but is diluted to about 15 percent for bottling. Genshu means it’s undiluted and can have a more intense flavor and aroma than the standard version. Talk like an expert: Ask if the drink is available by the tokkuri (carafe), if that tokkuri can be poured into a corresponding choko (small cup), which sake is available by the yongobin (720-ml bottle) or if the server pours it from an isshobin (1.8-L magnum bottle) overflowing into a masu (180-ml wooden or lacquer box). At the very least, toast your drinking companion with a hearty kanpai!